My name is Britney. A military brat turned yogi. I've lived many places including Europe and America. 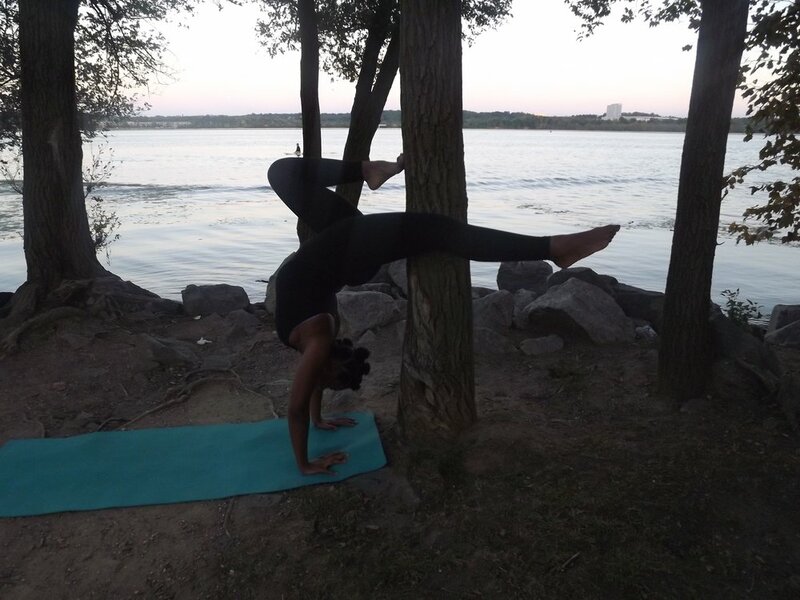 I currently teach in Virginia but started my yoga practice in Cleveland, Ohio. I run the family wellness center called "Tranzition Me" on Duke Street in Alexandria, VA. We have body wraps, a FAR Infrared sauna as well as colonics. So on top of teaching private and group yoga, I am the Director of the center as well as a Colon-hydrotherapist. It's safe to say I wear many hats. I teach and practice Baptiste yoga. Also, slow flow or Yin yoga. I'm really interested in learning the primary series of Ashtanga and am looking for a teacher. I was born on the last day of March in '88. =] I'm an Aries sun, Virgo moon, Aquarius rising. Fun Fact: I have a pretty limited diet. No land animals, dairy or gluten. & I'm still a shapely woman. The trick is avocados. If I had to choose a city to say I'm from, it's 216 forever. My good friend Star Prater first introduced me to yoga. She dragged me to class in the snow. The first class I hated. The second class I didn't like. I kept going, but don't remember why. I just know, after class things just felt *right* Now here I am Teaching full-time. I set an intention every time my foot hits the mat. It's my safe space. It's the one thing I can say I fully own. Tell me about your practice? Any aspects you'd like to share. When I first began yoga, I was in an okay space but didn't have much direction. I found myself living day to day but, without purpose. Yoga changed that by forcing me to spend time with myself. My practice is the one thing I can turn to that is ever evolving. It makes me focus and connect with the social unconscious as well as my ancestors. Moving meditation allows me to follow my thoughts clearly. When off the mat, I feel the benefits of yoga all day long. Besides having a clear head, I feel light in my body. I take fuller breaths which in turn, makes me aware of my reactions to others. I'm able to be of better service to those around me this way. The biggest challenge I've come across with yoga, in the beginning, was the feeling of belonging. I loved all the studios I went to, but felt a lack of representation. "Where are the black women of all shapes and sizes ?" is a question I found myself asking too often. Not seeing people that look like me is something I've always dealt with especially growing up overseas. It's important to know there are black bodies practicing yoga. & not just Trap Yoga, all kinds of yoga! 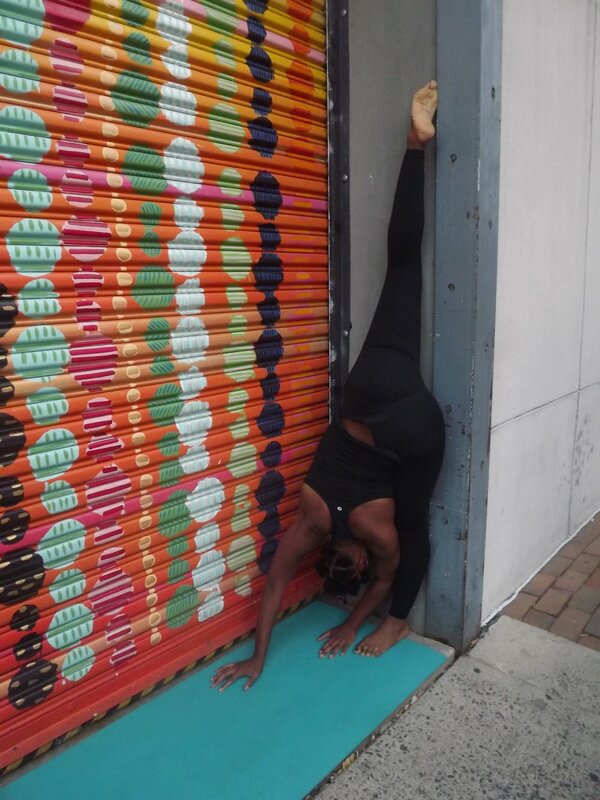 I am finding more black Yoga Teachers, and it is essential we create a community. I love seeing my practice inspire others to start. One of my biggest accomplishments is getting my parents to begin their practice. It's a beautiful thing when you can teach someone who has taught you everything. Yoga has taught me that I have not always been the best listener. LOL! I am much better at hearing cues from my teachers about alignment now. It was not easy for me in the beginning. Listening to my thoughts made it hard to hear the world around me. My favorite pose is headstand because it took me so long to master, and I'm still not even close to the best! Most challenging is between that and crow pose. I love/hate crow pose because when I finally land this pose it means I have been putting in work with my strength. I also easily lose this pose if I don't keep practicing. Yoga makes me feel AMAZING every. time. While practicing, I create challenges for myself that in the end, make me feel accomplished. - "Be Here Now" - Ram Dass is my absolute favorite quote. Advice for new yogis: Make it a point to practice every day. Even if for only a few minutes and all you do is down dog. Advice for longtime practitioners: Always go back to the basics and take a beginner's course often. Simply go in head first. There is no sugar coating it. No one is going to do it for you what you must do for yourself, no matter your reason for starting. If you're interested in yoga or even reading this, take that class. You just never know. It will not be easy, but nothing worth it ever is. Yoga gives me an aerial view. Yoga gives me a chance to explore perspectives, so in turn, I can come outside of myself, and feelings, and analyze without judgment. Yoga and my practice are so good for my mental health simply because it makes me aware of it. Being aware of my mental health does not mean I need to do anything about it, I can be in a space of acceptance. As a black woman that comes from a long line of black women, we have not always been accepted in spaces with everyone else. Inclusion is necessary. & Yoga is needed. As a black person, I want to create a space where we can practice and feel safe. We can address issues happening in our community. We can just be. Illnesses like diabetes and cancer run rampant in our culture and a lot of us turn to trust our doctors instead of figuring out what's wrong with self FIRST. I'm not saying don't go to your doctor, but at the sign of a runny nose instead of automatically popping some over the counter or prescription meds, we can sit with ourselves and begin to see where the problem stems so that we can practice more preventative methods. I believe with my whole heart that the awareness that yoga brings can help change this mindset and in turn will put our trust and our monies back into our community. I love Instagram for this very reason. Witnessing the generation take photos of their practice has been a beautiful change that I am thankful for. I'm able to look at and admire women that look like me, and women who don't. Men too! People from all backgrounds. Some with desk jobs, some who live a wild and adventurous life. Real black people are practicing yoga. It's why I started posting photos of my own. How has your hair affected your practice? Once I was teaching a chair yoga class at a senior home in Ohio as a new teacher. I was moving my students through each pose with ease. I had them sit, then stand, then sit again during this particular sequence. The last "sit" caused a woman to pass gas SO loud it startled me, and I forgot my place. I love Lululemon mats. I own too many. Also, I have a heavy chest and find Nike running bras work best for me. My favorite yoga book is Meditations from the Mat by Rolf Gates and Katrina Kenison. It was a book that truly helped me stick to my daily practice.